The HYGRO CONTROL patented technology creates and controls very high Relative Humidity conditions spraying a uniform and dry fog in the storage room. The micro-droplets immediately integrate into the air increasing humidity without wetness both on the products and the room. As a results, stored fruits and vegetables preserve their weight and firmness. 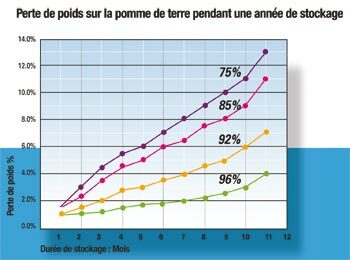 HYGRO CONTROL solutions maintain up to 95% RH during all the storage period, despite variations in temperature from -1 to 70°C. In one season alone, stored fruit and vegetables can lose between 3-20% of volume when stored at 80% RH, depending upon the application. HYGRO CONTROL increases RH and is able to maintain it at higher levels up to 96%, which results in reduced losses by 80%. HYGRO CONTROL's record and performance demonstrate a high return on investment, showing results and profits within the same year. The system is modular and easy to maintain, with low operational costs. With thousands of installations around the world, HYGRO CONTROLs solution provides continual humidity control to leading storage facilities. For client references please contact us. HYGRO CONTROL atomizer is a flexible solution which can be used for additional applications such as anti-sprouting treatments and anti-bacterial sprays, with minimal clogging. The atomized spray reaches all surfaces uniformly throughout the bulk pile or in the bins. Benefits include automatic controls which enable spraying with no exposure to the employees.